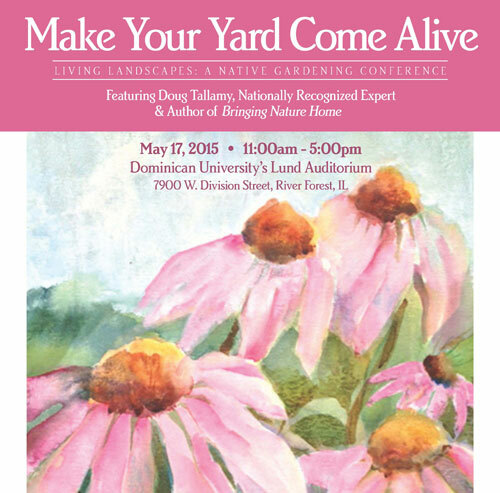 West Cook Wild Ones will present Living Landscapes: A Native Gardening Conference and Native Plant Sale from 11 a.m. to 5 p.m. Sunday, May 17, at Dominican University, 7900 W. Division St., in River Forest. As keynote speaker, renowned author Doug Tallamy ("Bringing Nature Home") will share his ideas on how we can reverse the decline in birds, bees, butterflies and other wildlife by creating islands of habitat in our own backyards. In addition, seven native plant experts will conduct workshops on topics ranging from rain gardens to rare plants to food gardens. One of these presenters, Trish Beckjord, works for Midwest Ground Covers and specializes in ecological design, helping people see the beauty of native plants. She holds a master’s degree in landscape architecture from the University of Michigan School of Natural Resources and Environment. How did you become interested in native plants? Well, I’ve always been interested in the outdoors and in natural areas ever since I was a child, visiting my grandmother’s cabin in the north woods of Minnesota. And so when I considered going back to school, one of my main goals was ecological restoration, which I got into through landscape architecture, because I also loved design. It seemed like a good way to put the pieces together. I used to be a quality manager for Abbott Laboratories before I went back to school. I’ve enjoyed all the knowledge I‘ve gained by making a turn in the road. A lot of my emphasis has become how to help people understand the beauty of native plants, why they are valuable and important to include in a landscape, and then also how they can fit in with the current aesthetic. What would you substitute for impatiens? Plant Jacob’s Ladder, Wild Geranium and Woodland Flox. Those aren’t going to give me color all season, but they belong here. They support our native bees, our native butterflies and birds. By planting these natives, we become part of an urban ecosystem that can help support that life. What will you be talking about at the West Cook Wild Ones Native Gardening Conference? I will present images of native plants in planted settings and talk about the principles I’m trying to convey. I will show people you don’t have to have something that looks like a wild prairie. If they don’t like that look, they can still plant native plants. I will help people understand which native plants are appropriate to use on a residential scale, and then show the beauty of them together. I think my philosophy of design would be to integrate the use of native plants wherever you can and however you can because they are critically important to the life around us. Using native species, using native sedges and grasses as well (it doesn’t have to be all flowers), as well as creating various layers in the garden. So ground planting, ornamental shrubs, looking at that and building a garden at all levels where you can use native plants. What kind of work do you do for Midwest Ground Covers? I am the native plant specialist for Midwest Ground Covers. We are a wholesale nursery and don't sell to the retail market. I help customers and the public understand how to add more native plants to their garden. If one of our customers has questions about design applications of native plants, I will also help in a consulting role in that regard. I do that for traditional landscape applications, I do it for green infrastructure applications such as rain gardens and bioretention swales, and I also do it for green roofs. The Good Earth Greenhouse carries plants from Midwest Ground Covers, and Green Home Experts carries plants from Pizzo, a Native Plants Nursery. West Cook Wild Ones is seeking volunteers for their May 17 Conference. Please respond at this link.